This is a unique 12 digit number which is different for each person. This number, basically, helps control its / her EPF accounts. U.A.N. is usually associated with an employee working in the organization. This number is issued by the Ministry of Labor and Employment of the Government of India. If a person changes his job, he will get a new PF account with the organization. In this way, an employee will be assigned multiple PF account numbers. Multiple PF account numbers are an area of ​​concern because many employees report complaints related to transfer and withdrawal of PF funds. To cope with this problem and to make management of provident fund accounts easier, the concept of UAN was introduced, UAN is a single account number that will add many id related to an employer. With UAN, an employee can add all of its EPFO ​​accounts to facilitate and transfer the PF withdrawal process. UAN is a twelve digit number assigned to each member who is contributing to the Employee Provident Fund. It enables quick and convenient transfer of money from one account to another. According to the new guidelines issued by EPFO, employees do not need verification from their employer for the return of PF funds, provided they have a valid UAN ID. UAN's main objection is to support the centralization of employee data and to reduce the dependency of the Employees Provident Fund Organization on employers for the purpose of employee verification. At present, the identity of the members is verified by the EPFO ​​through the data received by the employers. With the introduction of UAN, the details of the member's bank account and KYC details are linked in such a way that the identity of the employee is verified and established. UAN will help the EPFO ​​in tracking every employee's job changes. If a person changes his job, then he has to give UAN number to his employer to link the new PF account. In this way, EPFO ​​will have updated information about where a person is employed at any time. In addition, the UAN will stop people from making unnecessary EPF withdrawal upon switching jobs. The government is making more employees aware of EPF benefits, with more growth in UAN linked data services. Now with the latest amendment of the EPF Act, inoperative accounts will continue to accrue interest. The activation of the UAN depends on the KYC details submitted by the applicant. Employees can add all their PF accounts to a single integrated account. 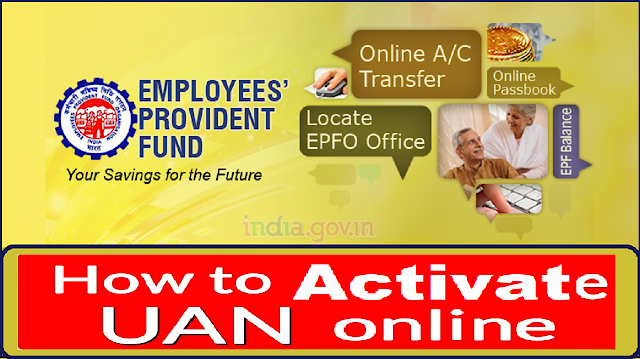 Employees can withdraw their PF online using UAN. Transferring PF funds from the old account to a new account also becomes easy with the UAN. Employees can check their EPF balance immediately using UAN member portal. Also, you can know the employee PF balance by sending an SMS with the UAN number. UAN is an identification number independent of employers. If your UAN base and KYC are verified then the employer will need to prove your profile. UAN will help employees manage their PF accounts online and this will mean that no employer will be able to withdraw the PF amount of any employee. If the company is submitting a PF every month or the company is only delaying the PF contribution by registering on the UAN portal, then the employee will be able to track. At present, any request for PF clearance has to go through your previous employer, it has to be signed and then sent to the EPFO. With UAN, the employer's intervention is reduced. After the completion of KYC verification of PF in your previous account, the transfer is automatically transferred to the new PF account. Transferring PF funds from one employer account to another used to be a long and tedious process. After the arrival of the UAN, there will be no need to transfer funds. To change accounts, you just have to mention the KYC and UAN details to the new employer. Once these details are verified by your new employer, then the PF amount will be automatically transferred to the new account from the old account. For older PF accounts opened before the UAN allocation, the transfer is still done digitally or physically. By registering on the EPF portal, the employee will receive an SMS alert from the EPFO, when contributed by the employer or the employee. Alerts you get on your phone will be very similar every time you have a debit or credit in your bank savings account. By mentioning UAN, you can also check your total balance by downloading the PF passbook from EPF portal. UAN means universal account number. This is very important for the employee working in an organization, because the entire process related to the services of the EPF is now capable of doing digital or online work. Employers who have 20 or more employees are required to get provident fund registration. Employees with salary up to Rs 15,000 should be enrolled under the Employees Provident Fund (EPF) scheme. Employers with less than 20 employees can also voluntarily get provident fund registration. Any employer who is registered under EPF scheme will be able to issue UAN to its employees who are enrolled under the scheme. This UAN is used as an employee's identity under the EPFO. It is also necessary to log on to EPFO ​​portal. 2. Now you will need to click on the "Activate UAN" option under the "Important Links" tab in the lower right corner of the screen, on the main page of the website. 3. Clicking on the "Activate UAN" option, the user will be redirected to a new webpage, now you will see some options in which you have to fill the right information such as name birthdate email id etc. and activate the UAN You can choose an option from your Aadhaar number or PAN card and UAN or Member ID and after that you will also have to fill out the information related to that option. 4. After filling all the details and auto-generated captcha code, the user has to click on the "Get Authorization Pin" option. 5. After this, the One Time Password or the OTP will be sent to the registered mobile number and the user will be redirected to a new webpage. 6. On this new webpage, the user has to confirm the details given by him in the previous page (UAN, name, date of birth, mobile number and email ID). 8. When your registration process is successful then your password is sent to your registered mobile number and your UAN successfully activates.